Many guests who are passing through stay for longer than they had originally planned. 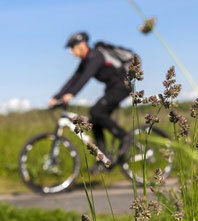 You can do various bicycle trips in the beautiful countryside. The cities Oldenburg, Bremen and Delmenhorst are only a short distance away. Please take into consideration we have an afternoon break from 13 to 2:30 p.m. Dogs and other pets are not allowed on the premises. We have our own biological sewage treatment plant and therefore we request you to use no chemicals for your toilet! The daily fee for families who are INF members is € 9, for non-members it is € 10. The fee for a Caravan, tent or RV is € 12 a day (max. € 65 a week, € 160 a month). Electricity, hot (shower) water and also sauna on 2 days a week is included. The current carrying capacity of electricity is 4 amps. Wi-Fi Internet is present at the premises (for a fee). There are supermarkets, a baker and a pharmacy in Kirchhatten (approx. 6 km or 4 miles).